Accomplishing the “redemption of Zion” was Joseph Smith’s primary concern for much of 1834 and 1835. 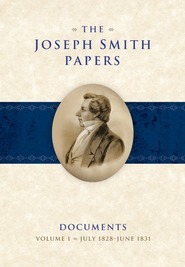 After the Latter-day Saints had been forcibly removed from their lands in Jackson County, Missouri—the place where they believed God had commanded them to build the city of Zion—Joseph Smith led numerous efforts to reclaim those lands and restore the Saints to their homes. Covering April 1834 through September 1835, the ninety-three documents featured in this fourth volume of the Documents series of The Joseph Smith Papersshed light on Joseph Smith’s attempts to redeem Zion and reveal his maturation as a leader and prophet for a growing church facing nearly constant challenges. ALEXANDER L. BAUGH was born and raised in Logan, Utah. He completed a master's degree at BYU in history in 1986 with an emphasis in western American and Mormon history. He became a full-time faculty member in Religious Education at bYU after completing his PhD in American history. In addition to his professorship, he also serves as a co-director of research for the Religious Studies Center at Brigham Young University. Professor Baugh and his family reside in Highland, Utah. Max H. Parkin holds a Ph.D. from BYU in Church history. A former institute instructor, he is the author of Conflict at Kirtland and directs tours to Church history sites and to the Middle East.